The key to using your evangelism marketing budget effectively is deciding who you want to reach, then finding the best ways to reach where those people are. There are many ways to reach potential interests: Road signs and banners reach people as they drive by your church neighborhood. Direct mail reaches people in their homes. Your members can take invite cards wherever they go and invite the whole neighborhood. But, in the modern world, there is one place where people spend a lot of their time. With nearly 2 billion active users, it’s the largest social network in the world, and by a huge margin. Two-thirds of Americans are active on Facebook, spending an average of 50 minutes per day on the platform. If you want to reach people where they are, Facebook has to be part of your mix. Your church should have a page where you post announcements, upcoming events, and pictures and videos after church activities. Some churches share their sermon videos every week. Your members are on Facebook, and your church page is a great way to communicate with them. How to use it: Begin promoting your evangelistic event 8 weeks prior to your event, to build excitement and help members get it on their calendars. Post at least twice a week until 2 weeks prior, when you should post every other day. Share articles about the topic, and your prayers for the event. Share your event pre-registration website, for people to sign up. Give people ideas for how to invite their friends and neighbors. Then make sure you and your church leaders like each post. The more likes a post gets, the more Facebook shares it with other users, so lots of likes will increase the visibility of a post to your members who have liked the church page. Members should post to their own social networks, letting people know that they’ll be at the meetings. The key is controlling how your members share on their pages. This helps make sure your marketing message has congruency through every channel. SermonView’s Direct Response Platform includes a complete social media sharing system that matches perfectly to your other marketing efforts. Your members can use the system to point people to the event website with the simple click of a button. They can also share posts from the church page, magnifying their effect. Facebook knows a lot about its users, so Facebook advertising allows you to target ads to geographic location, age and interests. 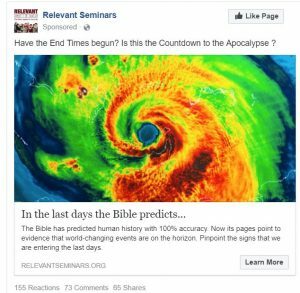 That means you can purchase ads that appear in user feeds of people, for example, who live within 10 miles of your church and are interested in Bible prophecy. 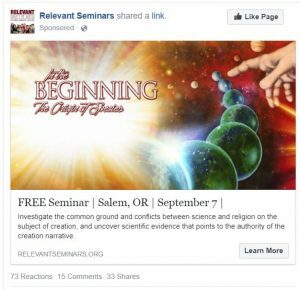 SermonView has developed a unique two-stage advertising program that runs before an event and has seen pretty amazing results. Initially, we use images and titles designed to provoke a response by viewers. This engagement leads to a higher relevance score. The higher the relevance score, the more Facebook shows your ad in your area. Then, as your mailing starts to land in mailboxes, we add branding ads to intensify the effectiveness of your other marketing efforts. These ads get to leverage the campaign’s relevance score, leading to more visibility, and ultimately to more people at your event. 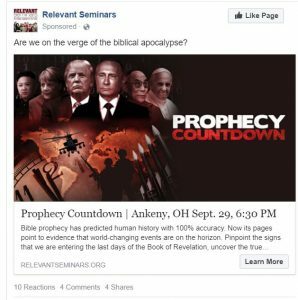 These ads work better when placed by a third-party organization, rather than your church page account because the initial ads can provoke some nasty responses, which may be hard for some of your members to see. But ultimately, this method gets more qualified people to your event. SermonView monitors these ads, and their reactions. We remove anything that is derogatory about the church, but leave other comments that may cause a comment chain. Facebook is a wonderful opportunity to maximize the effectivenss of any church’s evangelism budget, but it takes constant attention and lots of data to see strong results. SermonView has a team that keeps up with the best practices for using Facebook, and we continually look for ways to leverage the platform for church outreach. Let us help you add Facebook to your evangelism marketing mix and we’ll show you how it can maximize any church budget.